BBC Big Painting Challenge finalist Jennifer Morrow (third from left) helped out with preparations for the grand opening of the upgraded Belshaw's Quarry Sculpture Park on April 7. Pictured with Jennifer are local residents Nikki Elliott, Ian McClearn, Dermot Hutchinson, Martin Millar and Jennifer McClearn. Northern Ireland’s newest geo-tourism site, the recently extended Belshaw’s Quarry Sculpture Park near Lisburn, will officially open to the public on Saturday, April 7. The official opening, which promises to be a day for all the family, will see Whitemountain & District Community Association (WDCA), along with some special guests, unveil a number of impressive new sculptures at Belshaw’s Quarry Nature Reserve on Bensons Road, just north of the city. BBC Big Painting Challenge finalist Jennifer Morrow (right) helping local residents make final preparations for the official opening of the upgraded Belshaw's Quarry Sculpture Park. The opening ceremony will be at 12 noon, followed by the unveiling of four new unique sculptures that connect human activity to the geology of the facility. Younger visitors can search out Dino the Dinosaur and could win a large Easter egg, and for the adults there will be a chance to win a hamper. In preparation for the latest installations at the park, WDCA held a volunteer day on March 24 to prepare some of the sculpture facilities and install new signage. Among those who helped out on the day was BBC Big Painting Challenge finalist Jennifer Morrow from Whitemountain, who is a regular visitor to the park and takes inspiration from the landscape. Thanking all those who helped out at the volunteer day, John Belshaw from WDCA commented: “The four new sculptures link 250 million years of geology to man’s activity during the limestone quarrying and the resulting flora and fauna at the Northern Ireland Environment Agency-owned reserve, which is also an Area of Special Scientific Interest. 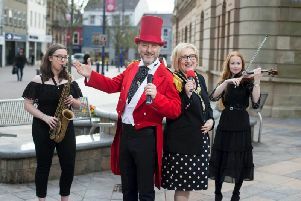 “Lisburn and Castlereagh City Council and The Alpha Programme have provided the funding for this phase of the project which will extend this unique venue for the benefit of residents and tourists. The four new sculptures will take the total number of artworks on display at the free-to-visit park to 12.